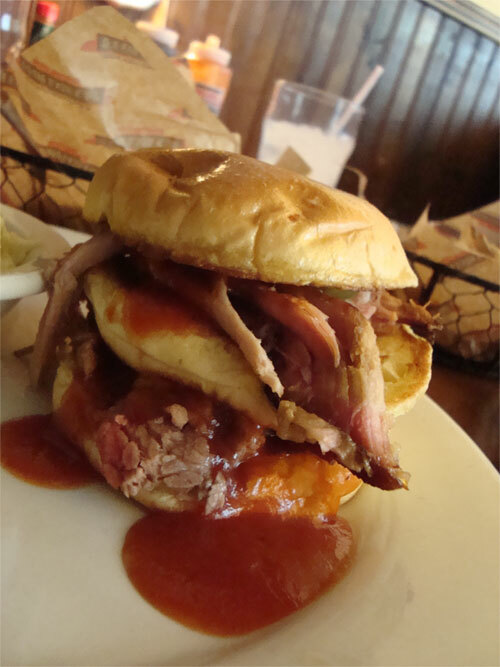 Pork on top, Brisket on the bottom. 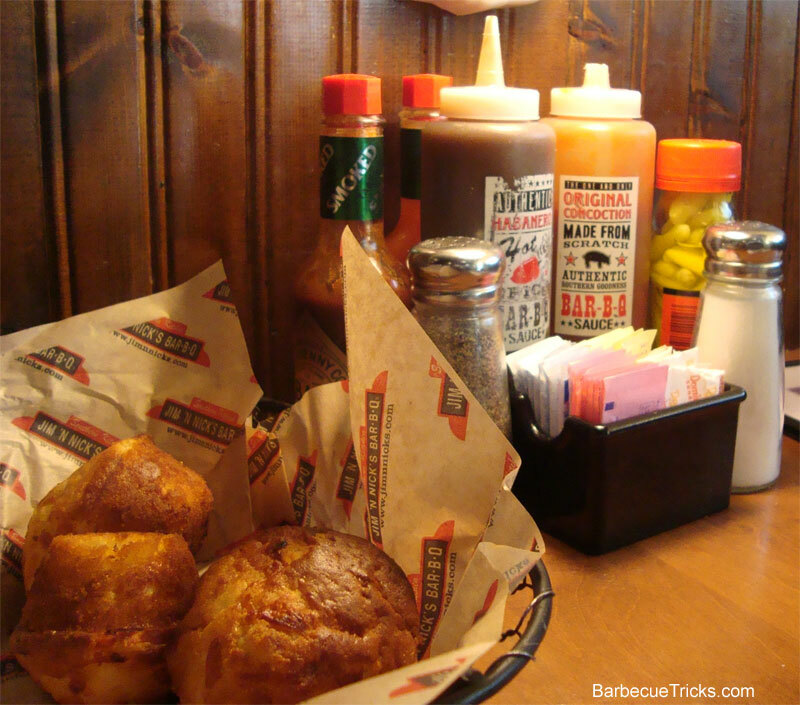 Sometimes it seems like the big chains get it all wrong with BBQ. The more you try to mass produce the more is lost or cheapened in the process. Not the case with Jim ‘N Nick‘s Barbecue. After a quick lunch visit last week I can see they are the real deal. Low and slow prep with fantastic sides and a killer smoke ring too. Hickory smoked shoulders – low and slow for 14 hours according to the website. 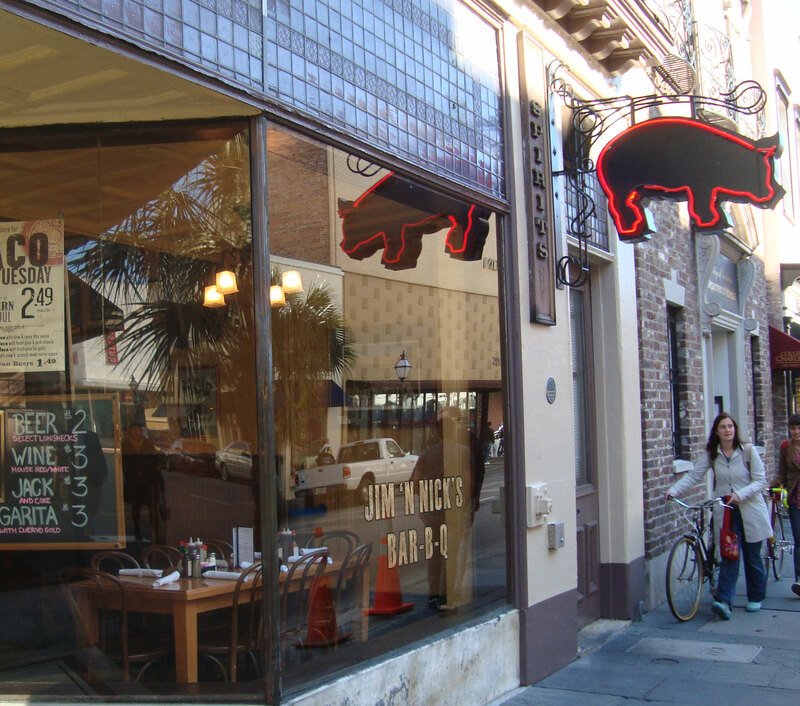 We visited the Jim and Nicks on King Street in downtown Charleston, SC. The million dollar South Carolina address made me feel like we were in the barbecue capital of the world. In fact, Jim ‘N Nick’s is in over seven states and almost 30 locations. It’s a big operation with a nice hometown feel. Love the neon pig sign out front. They claim “Scratch Made Everything” and it tastes legit. I had a feast of the “Double Decker” featuring some pulled pork on top and beef brisket on the bottom. I savored picking apart each level and noted a strong red smoke ring on both the pork and the beef. As usual I preferred the spicy version of their sauce… but would have been happy with a little less butter on the bun. It didn’t stop me. All the sides were good but the basket of cheese biscuits they served (and re-filled) were the best. At first I thought it was a special cornbread with it’s substantial heft. But it sounds like the biscuits are one of the claims to fame. Make sure you try ’em. We also sampled a variety of tacos (they feature Taco Tuesdays at some locations) with a good dose of pico and cilantro along with the pulled pork. Another winner. We left stuffed and happy with a few items still to try. Next time ribs and onion rings. With the memory of those Cheese biscuits still in my head I decided to search for a good recipe to mimic them and lo and behold there are a few copycats out there. I’ll pass along this step by step from the Gastronomy Blog worth a mention for the great photos.